A vote to end direct military rule has slid into confusion, with accusations of cheating and both sides claiming they can form a government. A clear outcome may be weeks away. With foreign funds already ditching shares, that’s a poor prospect for a cooling $460 bln economy. Thailand’s two main political parties each claimed that they had enough support to form a coalition government on March 25, a day after the country went to the polls for the first time since a 2014 military coup. Both the pro-army party, seeking to keep junta leader Prayuth Chan-ocha as prime minister, and the opposition linked to former premier Thaksin Shinawatra, said they could command enough parliamentary seats. On March 25, the Election Commission posted the winners of 350 seats contested on a first-past-the-post basis, out of a total of 500 in the lower house. The pro-Thaksin Phew Thai Party was ahead with 137 seats, compared to 97 seats for the Prayuth’s Palang Pracharat Party. Official results for the remaining 150 “party seats”, will not be announced until May 9. 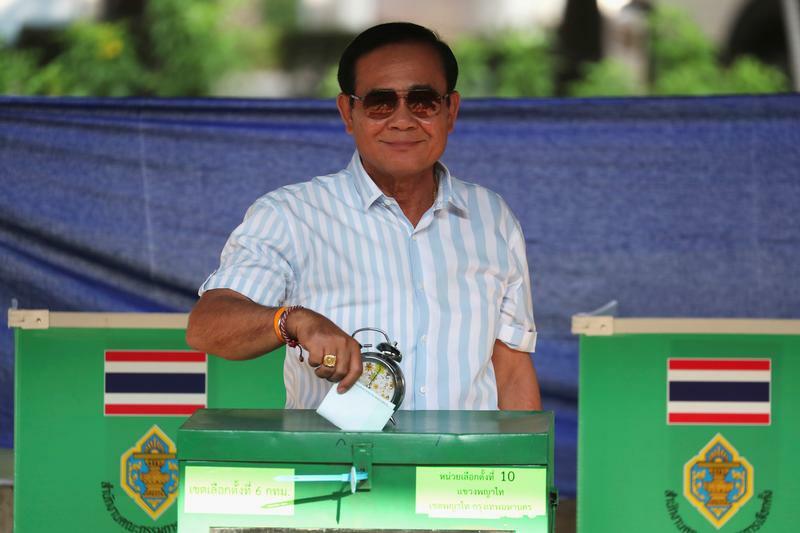 Pheu Thai has said it is considering a legal challenge over poll irregularities, and Thaksin wrote in a New York Times article on March 25 that the government should reflect “the will of the people, not the will of the junta”. On the eve of the March 24 vote, King Maha Vajiralongkorn made an unexpected statement on the election, recalling a comment made by his late father on the need to put “good people” in power and prevent “bad people from… creating chaos”. The Thai baht strengthened slightly against the U.S. dollar on March 25, to 31.58. On the same day, Thailand’s benchmark stock index initially fell less than neighbouring bourses battered by U.S. recession fears, but fell further as it became clear the result was contested, ending the session down 1.2 percent.